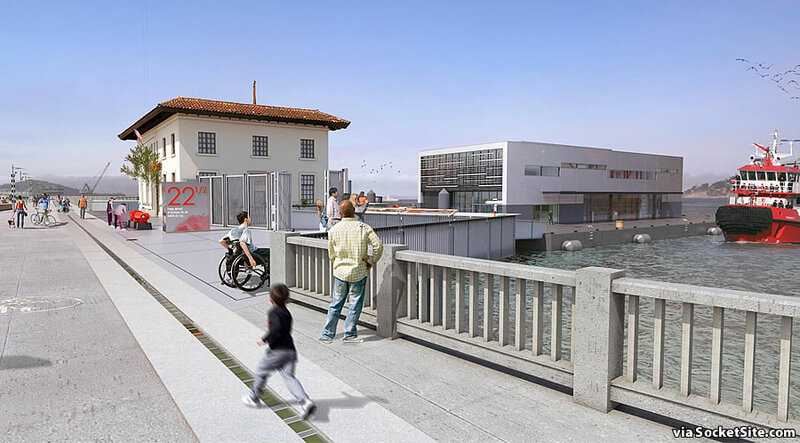 Having ditched the previously proposed smooth aluminum exterior panels and terracotta screens, “that lacked precedent within the historic district,” and adopted a corrugated metal finish with aluminum airfoil louvers at either end, the refined plans for a floating expansion of San Francisco’s historic Fire Station 35 at Pier 22 ½, which was built back in 1915 and designated a San Francisco Landmark in 1999, are closer to becoming a reality. 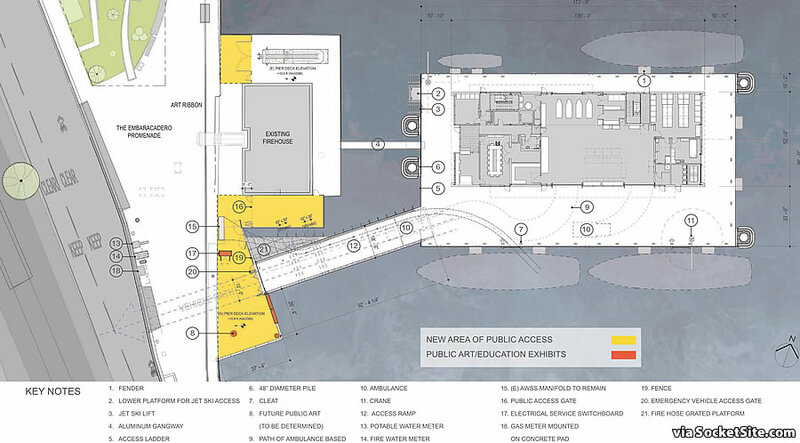 Once again, the proposed floating structure would accommodate a third fire boat; new rescue watercraft, jet skis and a dive boat; men’s and women’s locker rooms, a dorm with 23 beds and officer quarters for 12; and direct ambulance access to the back of fire station for transfers of those who are injured. 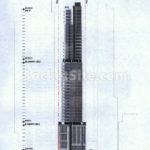 The refined plans include new observation and overlook areas for the public as well. 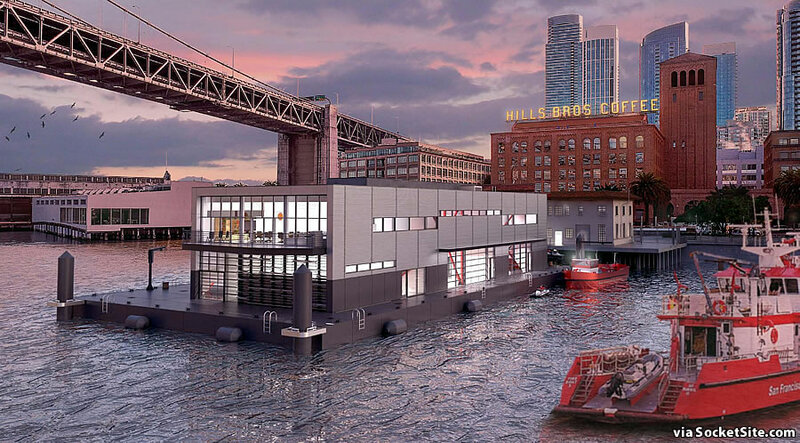 And if all goes as planned, the new floating station, which is to be assembled on a barge docked at Treasure Island and transported across the bay, will be delivered and operational in 2021 while the historic fire station building will continue to house a fire engine and fitness room for the San Francisco Fire Department’s Engine Company #35. I had an opportunity to tour this station a few years back with a friend who knew one of the firefighters personally. Layers on top of layers of history (and grime) that give you time travel vibes. Based on how cramped and outdated the facility currently is, I have no doubt that the crew and staff will be excited to have a new, bigger space. this is a bit over the top to me, i mean in terms of how cool it is! And once again SS fails to mention the architects. Nice. Try including the name in the main article. Is it really that difficult? What a lame excuse. Of course, one could try following the given link to our original article on the project and its design as well. But that would require a click (versus multiple keystrokes to whinge). Fewer keystrokes than yours. Seriously, just include it instead of blaming others for your shortsightedness. I think SocketSite’s stubbornness is one of the reasons I keep coming back here. So amusingly snappy in the comments. No. The snark is merely an appropriate response to laziness, blindness, and smugness. The OP had a point, or perhaps I should say he would have had a point if this were the original (or only) post; but recitation of pertinent info – including the architect(s) – in the first post only, and a linking to that in subsequent ones is quite appropriate, as it allows a focus on new info, and prevents unwieldiness (indeed, the ability to link might be seen as one of the big advantages of the internet). Anyone know which bond issue is funding this project? The $400 million Earthquake Safety and Emergency Response (ESER) Bond which was passed in June of 2014. 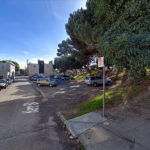 To add some context, this is a major pump station for the on site fireboats to pump bay water into the water hydrant system should the need arise to put out major fires across San Francisco. It’s set up so water can be taken in, in the case that reservoir and cistern water is depleted or needed elsewhere to fight fires. Basically trying to combat the extensive fires that happened after the major earthquake in 1906. “…terracotta screens, ‘that lacked precedent within the historic district,’ and adopted …aluminum airfoil louvres”. Uh, I guess they didn’t look at the roof of the existing firehouse, the new and the historic Hills Plaza buildings directly across the street, the Agricultural Building next door, and the YMCA across the street. Yup, other than those, no terra cotta. What’s the seismic retrofit status of the current old building and the pier it sits on? Also, how would seawall repair/retrofit along Embarcadero affect both the new proposed structure and the existing one?